Many of our guests arrive as strangers and leave as friends. Pinnacle Walking Holidays are perfect for those who enjoy the company of others and being part of a small group of like minded people. We set out to offer good value for money walking holidays in great locations; our knowledge and service will always ensure your stay will be a truly memorable one. All our walking holidays and breaks are based in personally and carefully chosen accommodation; we have selected them for their friendliness, warm hospitality and excellent locations. We once heard a saying; “Find a job you love and you will never have to work again”; so far this proves to be true for us at Pinnacle Walking Holidays. We’ve found a job we love and now share our passion for mountain walking with friends old and new. 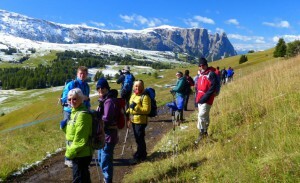 We offer very personal, small group walking holidays in stunning locations. 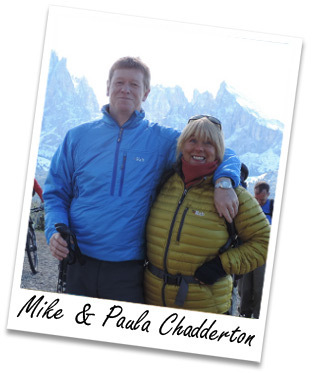 We met in 1986 when we were both working in the Optical profession, Mike had done quite a few long distance walks and it soon became apparent that I shared his love of the outdoors. Our first holiday together was rambling in the Lake District climbing Skiddaw, Hellvelyn and one of our particular favourites, the Fairfield Horseshoe. We continued to enjoy hiking holidays and breaks in both the UK and Europe, but after many years of ‘nine-to-five’ we threw caution to the wind, gave up our jobs and decided to run a ski chalet in the Three Valleys in the French Alps: It was hard work, but we loved living in the mountains and realised we could never return to normal everyday jobs. The Italian Dolomites was to be our next adventure and we spent two seasons working for a well known Mountain Holiday Company in Arabba: Mike was a walking tour leader and I ran a chalet. It was a very special time for us as we met so many awesome people from all around the world who remain friends to this day. The walking and the scenery of the Dolomites is fantastic, some of the best we have ever seen, not to mention the flora and fauna. After another spell of hard work we took three months off and did some touring in Europe; walking in the Spanish Pyrenees, Provence, the Dordogne and eventually ending up, for our final six weeks, in Chamonix. We were blown away by the views of Mont Blanc and all the hiking this area has to offer. Since then, every time we return for a holiday it feels like going home.